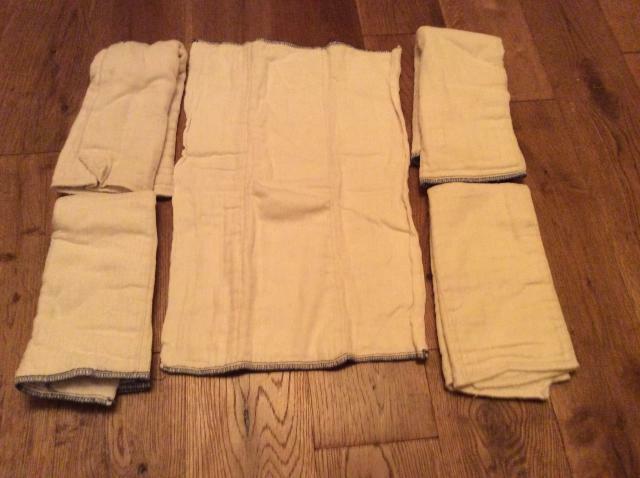 5 Cotton Bottoms small/medium nappies/prefolds, good condition. Suitable for babies 8-30lbs. I have 12 in this size, I can sell any amount, let me know what you need and I can give you a quote. I am also selling other nappies and wraps, mostly Cotton Bottoms in this and other sizes. Second class mail. From a pet and smoke free household. Last edited by MEC on Sat Jan 20, 2018 1:33 pm, edited 7 times in total. Re: 5 Small/medium Cotton Bottom nappy, suitable for 8-30lbs. Hi, how much would 10 of these be including postage? £9.32, including paypal and postage costs. Second class post. Brilliant, I'll take 10 then. I'll send you private message! Hi - what are the dimensions of these? The ones with white stitching are 46cm long and 32cm wide. The ones with blue stitching are 45cm long and 31 cm wide. Perfect. Do you have 10 of the ones with white stitching still available and if so how much including paypal and postage? I definitely have 10 available, I will bag them up and work out postage for you asap. £9.32 including nappies, second class postage and PayPal fees. I can private message you so you have my email address, or you can pm me and I'll do a money request through PayPal.